Most wizards have a linear structure, with page 1 followed by page 2 and so on until the last page. The Class Wizard example shows how to create such wizards. 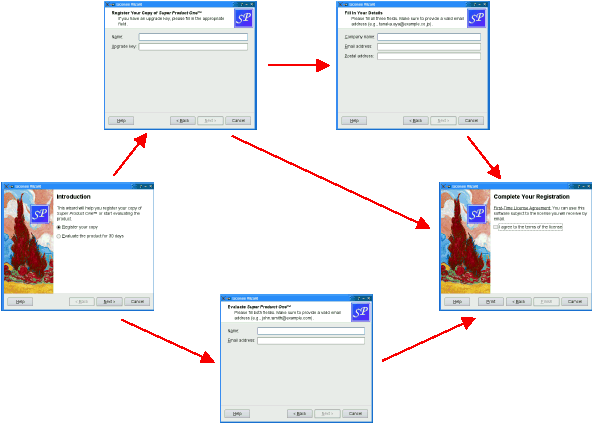 LicenseWizard inherits QWizard and implements a non-linear five-page wizard that leads the user through the process of choosing a license agreement. IntroPage, EvaluatePage, RegisterPage, DetailsPage, and ConclusionPage are QWizardPage subclasses that implement the wizard pages. For this example, the IDs are arbitrary. The only constraints are that they must be unique and different from -1. IDs allow us to refer to pages. In the constructor, we create the five pages, insert them into the wizard using QWizard::setPage(), and set Page_Intro to be the first page. We configure the QWizard to show a Help button, which is connected to our showHelp() slot. We also set the LogoPixmap for all pages that have a header (i.e., EvaluatePage, RegisterPage, and DetailsPage). message = tr("Sorry, I already gave what help I could. " In showHelp(), we display help texts that are appropriate for the current page. If the user clicks Help twice for the same page, we say, "Sorry, I already gave what help I could. Maybe you should try asking a human?" 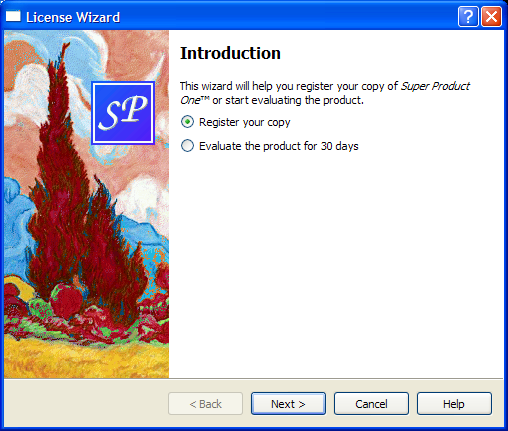 The pages are defined in licensewizard.h and implemented in licensewizard.cpp, together with LicenseWizard. topLabel = new QLabel(tr("This wizard will help you register your copy of "
"<i>Super Product One</i>&trade; or start "
evaluateRadioButton = new QRadioButton(tr("&Evaluate the product for 30 "
The nextId() function returns the ID for EvaluatePage if the Evaluate the product for 30 days option is checked; otherwise it returns the ID for RegisterPage. setSubTitle(tr("Please fill both fields. Make sure to provide a valid "
First, we set the page's title and subTitle. Then we create the child widgets, create wizard fields associated with them, and put them into layouts. The fields are created with an asterisk (*) next to their name. This makes them mandatory fields, that is, fields that must be filled before the user can press the Next button (Continue on macOS). The fields' values can be accessed from any other page using QWizardPage::field(). Resetting the page amounts to clearing the two text fields. The next page is always the ConclusionPage. This time, we reimplement QWizardPage::initializePage() and QWidget::setVisible(), in addition to nextId(). We also declare a private slot: printButtonClicked(). The default implementation of QWizardPage::nextId() returns the page with the next ID, or -1 if the current page has the highest ID. This behavior would work here, because Page_Conclusion equals 5 and there is no page with a higher ID, but to avoid relying on such subtle behavior, we reimplement nextId() to return -1. We use QWizard::hasVisitedPage() to determine the type of license agreement the user has chosen. If the user filled the EvaluatePage, the license text refers to an Evaluation License Agreement. If the user filled the DetailsPage, the license text is a First-Time License Agreement. If the user provided an upgrade key and skipped the DetailsPage, the license text is an Update License Agreement. If the page is shown, we set the CustomButton1 button's text to Print, we enable the HaveCustomButton1 option, and we connect the QWizard's customButtonClicked() signal to our printButtonClicked() slot. If the page is hidden, we disable the HaveCustomButton1 option and disconnect the printButtonClicked() slot. See also QWizard, Class Wizard Example, and Trivial Wizard Example.